We have a full grooming salon to accommodate dogs of all sizes and offer many services. Services are available with day camp, boarding, or by appointment. 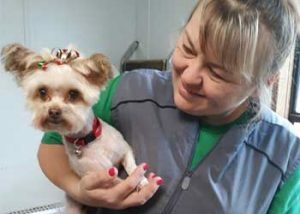 Shannon has many years of experience as a grooming professional and will treat your pup with compassion and kindness. She has received rave reviews from many current clients for her expertise in full grooms by breed, special requests (yep, she does mohawks!) and for her customer interaction. She is also known for her special way with young pups being groomed for the first time and silver seniors who may find it difficult to get comfortable due to age. So whether it’s a full groom, a deluxe bath, or any other grooming service, Shannon will do an excellent job and send your camper home looking fabulous! 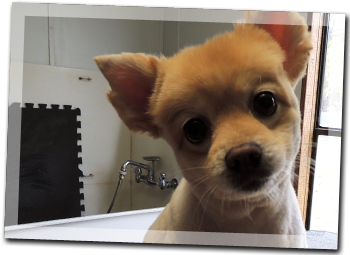 Includes deep cleaning bath, ear cleaning, nail trim (dremmel available), hairstyle of choice. Price is by weight and coat condition. Includes a deep cleaning bath, ear cleaning, nail trim (dremmel available), between toe pad and under belly sanitary. Prefer your camper fur to be long? Keep it luxurious and avoid matting at the root by scheduling an in-between groom brush-out. Includes a brush out, spritz, and ear cleaning. Call for pricing. Want Natural Shampoo options for your favorite fido? We have many products available. Additional charges apply. Call for pricing. Requirements: All dogs must be up-to-date on all vaccinations including DHPP, Rabies and Bordatella. Bordatella must be given a minimum of ten days prior to groom. Sheba Shuttle Service Available. Please call for details.